It is the custom in this country to save the top tier of the wedding cake for the first year anniversary. 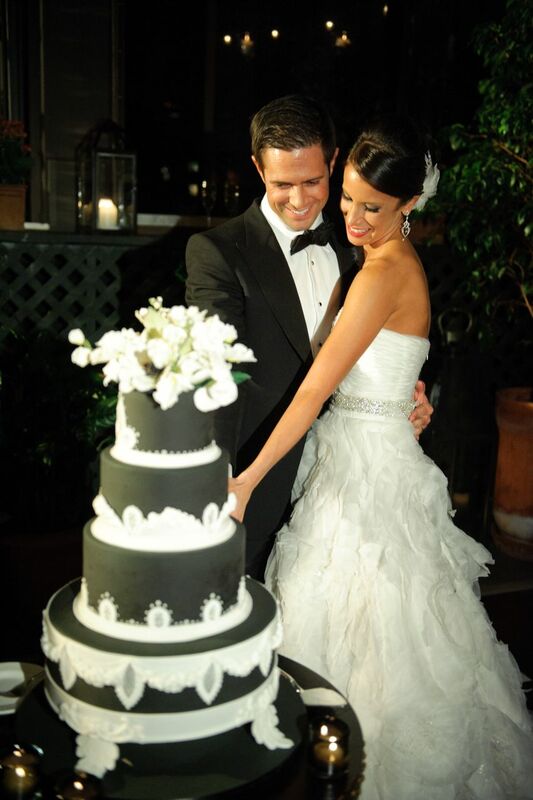 (When you get a wedding cake from us – the top tier is our gift to the couple – Ron loves this tradition!) But the question is, how do you package the top tier to put in the freezer? Top tiers from a variety of cakes that we produced at the bakery. 1. Once the cake gets home put the top tier back in the fridge, sugar flowers and all. Let the butter cream get firm in the fridge. Leave it for at least 3 hours or overnight is best. 3. Take the cold cake tier and wrap it in multiple layers of plastic wrap. You want to try and keep as much air out as possible. You can either put the wrapped tier in a zip lock baggie or for more protection a plastic container. Tuck it away in the freezer. A couple of days before the cake is to be consumed take the cake out of the freezer and put in the refrigerator. The day you are going to eat the cake, take out of the fridge 2-3 hours before. Unwrap, the cake and put on a plate and leave on the counter. Let the cake gradually come to room temperature and enjoy. If you have wrapped the cake up really well, it should taste just as delicious as it did the day of your wedding. At least that is what our clients tell us!